We love seeing children as patients during our children’s dentistry services! Helping children learn that a visit to the dentist can be easy and fun is the goal of every visit because we know this helps them follow through on good dental care for a lifetime. We take this responsibility VERY seriously. So our first priority is comfort and trust…no matter what! 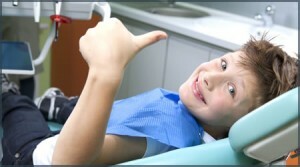 We do not force dentistry on children we work with them to gain their respect and confidence. One bad experience can affect a child for the rest of their life. Many dental offices do not allow parents in the hygiene room or operatory when children are in the office. In our office, parents are encouraged to be a part of the child’s visit. No worries that their children may be mistreated; Just total assurance that they are getting terrific care under happy, healthy circumstances. With our happy friendly dentist for kids.